"Fresno" redirects here. For other uses, see Fresno (disambiguation). Fresno (/ˈfrɛznoʊ/ FREZ-no (Spanish for "ash tree") is a city in California, United States, and the county seat of Fresno County. It covers about 112 square miles (290 km2) in the center of the San Joaquin Valley, the southern portion of the California's Central Valley. With a census-estimated 2016 population of 520,000, Fresno is the fifth-most populous city in California, the most populous city in the Central Valley, the most populous inland city in California, and the 34th-most populous city in the nation. Named for the abundant ash trees lining the San Joaquin River, Fresno was founded in 1872 as a railway station of the Central Pacific Railroad before it was incorporated in 1885. The city has since become an economic hub of Fresno County and the San Joaquin Valley, with much of surrounding areas in the Metropolitan Fresno region predominantly tied to large-scale agricultural production. The population of Fresno proper soared in the second half of the 20th century, growing from a 1960 census population of 134,000 to a 2000 census population of 428,000. It was here in Fresno in 1958 that Bank of America first launched the BankAmericard credit card, which was later renamed Visa. Fresno is near the geographical center of California. It lies approximately 220 miles (350 km) northeast of Los Angeles, 170 miles (270 km) south of the state capital, Sacramento, and 185 miles (300 km) southeast of San Francisco. Yosemite National Park is about 60 miles (100 km) to the north, Kings Canyon National Park is 60 miles (100 km) to the east, and Sequoia National Park is 75 miles (120 km) to the southeast. 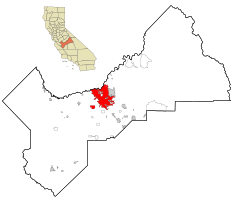 The county of Fresno was formed in 1856 after the California Gold Rush. It was named for the abundant ash trees lining the San Joaquin River. The county was much larger than it is today as part of Tulare County, comprising its current area plus all of what became Madera County and parts of what are now San Benito, Kings, Inyo, and Mono counties. Millerton, then on the banks of the free-flowing San Joaquin River and close to Fort Miller, became the county seat after becoming a focal point for settlers. Other early county settlements included Firebaugh's Ferry, Scottsburg and Elkhorn Springs. The San Joaquin River flooded on December 24, 1867, inundating Millerton. Some residents rebuilt, others moved. Flooding also destroyed the town of Scottsburg on the nearby Kings River that winter. Rebuilt on higher ground, Scottsburg was renamed Centerville. In 1867, Anthony "McQeen" Easterby purchased land bounded by the present Chestnut, Belmont, Clovis and California avenues, that today is called the Sunnyside district. Unable to grow wheat for lack of water, he hired sheep man Moses J. Church in 1871 to create an irrigation system. Building new canals and purchasing existing ditches, Church then formed the Fresno Canal and Irrigation Company, a predecessor of the Fresno Irrigation District. In 1872, the Central Pacific Railroad established a station near Easterby's—by now a hugely productive wheat farm—for its new Southern Pacific line. Soon there was a store around the station and the store grew the town of Fresno Station, later called Fresno. Many Millerton residents, drawn by the convenience of the railroad and worried about flooding, moved to the new community. Fresno became an incorporated city in 1885. By 1931 the Fresno Traction Company operated 47 streetcars over 49 miles of track. In 1877, William Helm made Fresno his home with a five-acre tract of land at the corner of Fresno and R streets. Helm was the largest individual sheep grower in Fresno County. In carrying his wool to market at Stockton, he used three wagons, each drawn by ten mules, and spent twelve days in making the round trip. 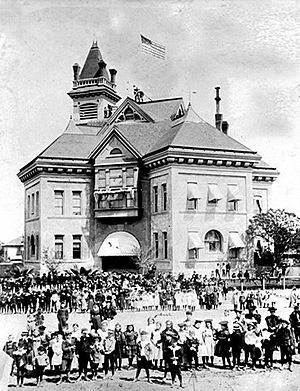 Two years after the station was established, county residents voted to move the county seat from Millerton to Fresno. When the Friant Dam was completed in 1944, the site of Millerton became inundated by the waters of Millerton Lake. In extreme droughts, when the reservoir shrinks, ruins of the original county seat can still be observed. In the nineteenth century, with so much wooden construction and in the absence of sophisticated firefighting resources, fires often ravaged American frontier towns. The greatest of Fresno's early-day fires, in 1882, destroyed an entire block of the city. Another devastating blaze struck in 1883. In 1909, Fresno's first and oldest synagogue, Temple Beth Israel, was founded. The population of Fresno proper soared in the second half of the 20th century. It entered the ranks of the 100 largest United States cities in 1960 census with a population of 134,000. In the 1990 census it moved up to 47th place with 354,000, and in the census of 2000 it achieved 37th place with 428,000, a 21 percent increase during the preceding decade. The Fresno Municipal Sanitary Landfill was the first modern landfill in the United States, and incorporated several important innovations to waste disposal, including trenching, compacting, and the daily covering of trash with dirt. It was opened in 1937 and closed in 1987. Today, it has the unusual distinction of being a National Historic Landmark as well as a Superfund site. Before World War II, Fresno had many ethnic neighborhoods, including Little Armenia, German Town, Little Italy, and Chinatown. In 1940, the Census Bureau reported Fresno's population as 94.0% white, 3.3% black and 2.7% Asian. (Incongruously, Chinatown was primarily a Japanese neighborhood and today Japanese-American businesses still remain). During 1942, Pinedale, in what is now North Fresno, was the site of the Pinedale Assembly Center, an interim facility for the relocation of Fresno area Japanese Americans to internment camps. The Fresno Fairgrounds were also utilized as an assembly center. Row crops and orchards gave way to urban development particularly in the period after World War II; this transition was particularly vividly demonstrated in locations such as the Blackstone Avenue corridor. In September 1958, Bank of America launched a new product called BankAmericard in Fresno. After a troubled gestation during which its creator resigned, BankAmericard went on to become the first successful credit card; that is, a financial instrument that was usable across a large number of merchants and also allowed cardholders to revolve a balance (earlier financial products could do one or the other but not both). In 1976, BankAmericard was renamed and spun off into a separate company known today as Visa Inc. The dance style commonly known as popping evolved in Fresno in the 1970s. In the 1970s, the city was the subject of a song, "Walking Into Fresno", written by Hall Of Fame guitarist Bill Aken and recorded by Bob Gallion of the world-famous "WWVA Jamboree" radio and television show in Wheeling, West Virginia. Aken, adopted by Mexican movie actress Lupe Mayorga, grew up in the neighboring town of Madera and his song chronicled the hardships faced by the migrant farm workers he saw as a child. Aken also made his first TV appearance playing guitar on the old country-western show at The Fresno Barn. Fictional residents of the town were portrayed in a 1986 comedic miniseries titled "Fresno", featuring Carol Burnett, Dabney Coleman, Teri Garr and Charles Grodin, along with numerous other celebrities. The mini series was presented as a parody of the prime time soap operas popular in the 1980s. In 1995, the Federal Bureau of Investigation's Operation Rezone sting resulted in several prominent Fresno and Clovis politicians being charged in connection with taking bribes in return for rezoning farmland for housing developments. Before the sting brought a halt to it, housing developers could buy farmland cheaply, pay off council members to have it rezoned, and make a large profit building and selling inexpensive housing. Sixteen people were eventually convicted as a result of the sting. Fresno is at . as having a total area of 112.3 square miles (291 km2) with 99.69% land covering 112.0 square miles (290 km2), and 0.31% water, 0.4 square miles (1.0 km2). Fresno's location, very near the geographical center of California, places the city a comfortable distance from several of the major recreation areas and urban centers in the state. Just 60 mi (97 km) south of Yosemite National Park, it is the nearest major city to the park. Likewise, Sierra National Forest is 40 mi (64 km), Kings Canyon National Park is 60 mi (97 km) and Sequoia National Park is 75 mi (121 km). Fresno has three large public parks, two in the city limits and one in county land to the southwest. Woodward Park, which features the Shinzen Japanese Gardens, numerous picnic areas and several miles of trails, is in North Fresno and is adjacent to the San Joaquin River Parkway. Roeding Park, near Downtown Fresno, is home to the Fresno Chaffee Zoo, and Rotary Storyland and Playland. Kearney Park is the largest of the Fresno region's park system and is home to historic Kearney Mansion and plays host to the annual Civil War Revisited, the largest reenactment of the Civil War in the west coast of the U.S. In its 2013 ParkScore ranking, The Trust for Public Land, a national land conservation organization, reported that Fresno had the worst park system among the 50 most populous U.S. cities. The survey measures median park size, park acres as percent of city area, residents' access to parks, spending on parks per resident, and playgrounds per 10,000 residents. Fresno was born with the establishment of the then Central Pacific Railroad Depot in 1872. In 1889 Southern Pacific Railroad, which had acquired Central Pacific, constructed a new depot on the original depot site. The brick Queen Anne style depot was a jewel for the city and is currently one of Fresno's oldest standing buildings. In 1971, 99 years after it first opened for business on its current site, the Depot closed its rail operations due to the decline in business. Between the 1880s and World War II, Downtown Fresno flourished, filled with electric Street Cars, and contained some of the San Joaquin Valley's most beautiful architectural buildings. Among them, the original Fresno County Courthouse (demolished), the Fresno Carnegie Public Library (demolished), the Fresno Water Tower, the Bank of Italy Building, the Pacific Southwest Building, the San Joaquin Light & Power Building (currently known as the Grand 1401), and the Hughes Hotel (burned down), to name a few. Fulton Street in Downtown Fresno was Fresno's main financial and commercial district before being converted into one of the nation's first pedestrian malls in 1964. Renamed the Fulton Mall, the area contains the densest collection of historic buildings in Fresno. While the Fulton Mall corridor has suffered a sharp decline from its heyday, the Mall includes some of the finest public art pieces in the country, including a casting of Pierre-Auguste Renoir's bronze "The Washer Woman", reportedly the only one of the six castings that one can walk up to and touch. Current plans call for the reopening of the Fulton Mall to automobile traffic. The public art pieces will be restored and placed near their current locations and will feature wide sidewalks (up to 28' on the east side of the street) to continue with the pedestrian friendly environment of the district. The neighborhood of Sunnyside is on Fresno's far southeast side, bounded by Chestnut Avenue to the West. Its major thoroughfares are Kings Canyon Avenue and Clovis Avenue. Although parts of Sunnyside are within the City of Fresno, much of the neighborhood is a "county island" within Fresno County. Largely developed in the 1950s through the 1970s, it has recently experienced a surge in new home construction. It is also the home of the Sunnyside Country Club, which maintains a golf course designed by William P. Bell. The popular neighborhood known as the Tower District is centered around the historic Tower Theatre, which is included on the National List of Historic Places. The theater was built in 1939 and is at Olive and Wishon Avenues in the heart of the Tower District. (The name of the theater refers to a well-known landmark water tower, which is actually in another nearby area). The Tower District neighborhood is just north of downtown Fresno proper, and one-half mile south of Fresno City College. Although the neighborhood was known as a residential area prior, the early commercial establishments of the Tower District began with small shops and services that flocked to the area shortly after World War II. The character of small local businesses largely remains today. To some extent, the businesses of the Tower District were developed due to the proximity of the original Fresno Normal School, (later renamed California State University at Fresno). In 1916 the college moved to what is now the site of Fresno City College one-half mile north of the Tower District. This vibrant and culturally diverse area of retail businesses and residences experienced a renewal after a significant decline in the late 1960s and 1970s. After decades of neglect and suburban flight, the neighborhood revival followed the re-opening of the Tower Theatre in the late 1970s, which at that time showed second and third run movies, along with classic films. Roger Rocka's Dinner Theater & Good Company Players also opened nearby in 1978, at Olive and Wishon Avenues. Fresno native Audra McDonald performed in the leading roles of Evita and The Wiz at the theater while she was a high school student. McDonald subsequently became a leading performer on Broadway in New York City and a Tony award-winning actress. Also in the Tower District is Good Company Players' 2nd Space Theatre. The Tower District has become a hub for community events such as Jamaica My Weekend, Mardi Gras in February, Gay Pride Parade, Car Shows, A Taste of The Tower, Halloween in the Tower, and the opened Farmer's Market on the North-West Corner of Olive and Van Ness. The neighborhood features restaurants, live theater and nightclubs, as well as several independent shops and bookstores, currently operating on or near Olive Avenue, and all within a few hundred feet of each other. Since renewal, the Tower District has become an attractive area for restaurant and other local businesses. Today, the Tower District is also known as the center of Fresno's LGBT and hipster Communities. ; Additionally, Tower District is also known as the center of Fresno's local punk/goth/deathrock and heavy metal community. The area is also known for its early twentieth century homes, many of which have been restored in recent decades. The area includes many California Bungalow and American Craftsman style homes, Spanish Colonial Revival Style architecture, Mediterranean Revival Style architecture, Mission Revival Style architecture, and many Storybook houses designed by Fresno architects, Hilliard, Taylor & Wheeler. The residential architecture of the Tower District contrasts with the newer areas of tract homes urban sprawl in north and east areas of Fresno. Homes from the early 20th century line this boulevard in the heart of the historic Alta Vista Tract. The section of Huntington Boulevard between First Street on the west to Cedar Avenue on the east is the home to many large, stately homes. The original development of this area began circa 1910, on 190 acres of what had been an alfalfa field. The Alta Vista Tract, as the land would become known, was mapped by William Stranahan for the Pacific Improvement Corporation, and was officially platted in 1911. The tract's boundaries were Balch Avenue on the south, Cedar Avenue on the east, the rear property line of Platt Avenue (east of Sixth Street) and Platt Avenue (west of Sixth Street) on the north, and First Street on the west. The subdivision was annexed to the city in January 1912, in an election that was the first in which women voted in the community. At the time of its admission to the city, the Alta Vista Tract was uninhabited but landscaped, although the trees had to be watered by tank wagon. In 1914 developers Billings & Meyering acquired the tract, completed street development, provided the last of the necessary municipal improvements including water service, and began marketing the property with fervor. A mere half decade later the tract had 267 homes. This rapid development was no doubt hastened by the Fresno Traction Company right-of-way along Huntington Boulevard, which provided streetcar connections between downtown and the County Hospital. The surrounding streets, Kerckhoff and Balch Avenues (which are part of the original Alta Vista tract), have homes from the Arts and Crafts era, which, like the downtown, are being renovated and brought back to their historic roots. During Christmas, the homes along the boulevard are adorned with lights and decorations. The nation's tallest living Christmas Tree, at Huntington and 6th Street, is the highlight of the event. Huntington Boulevard has been referred to as Fresno's "anti-gated community". North of Shaw Avenue, Van Ness continues as the Van Ness Extension, between Marks Avenue and West Avenue. Van Ness Extension is considered the most prestigious neighborhood in the city, and boasts some of Fresno's most elaborate homes and most affluent citizens. Residents include many notable doctors, business owners, entrepreneurs, and stock traders. The "West Side" of Fresno, also often called "Southwest Fresno", is one of the oldest neighborhoods in the city. The neighborhood lies southwest of the 99 freeway (which divides it from Downtown Fresno), west of the 41 freeway and south of Nielsen Ave (or the newly constructed 180 Freeway), and extends to the city limits to the west and south. The neighborhood is traditionally considered to be the center of Fresno's African-American community. It is culturally diverse and also includes significant Mexican-American and Asian-American (principally Hmong or Laotian) populations. The neighborhood includes Kearney Boulevard, named after early 20th century entrepreneur and millionaire M. Theo Kearney, which extends from Fresno Street in Southwest Fresno about 20 mi (32 km) west to Kerman, California. A small, two-lane rural road for most of its length, Kearney Boulevard is lined with tall palm trees. The roughly half-mile stretch of Kearney Boulevard between Fresno Street and Thorne Ave was at one time the preferred neighborhood for Fresno's elite African-American families. Another section, Brookhaven, on the southern edge of the West Side south of Jensen and west of Elm, was given the name by the Fresno City Council in an effort to revitalize the neighborhood's image. The isolated subdivision was for years known as the "Dogg Pound" in reference to a local gang, and as of late 2008 was still known for high levels of violent crime. While many homes in the neighborhood date back to the 1930s or before, the neighborhood is also home to several public housing developments built between the 1960s and 1990s by the Fresno Housing Authority. The US Department of Housing and Urban Development has also built small subdivisions of single-family homes in the area for purchase by low-income working families. There have been numerous attempts to revitalize the neighborhood, including the construction of a modern shopping center on the corner of Fresno and B streets, an aborted attempt to build luxury homes and a golf course on the western edge of the neighborhood, and some new section 8 apartments have been built along Church Ave west of Elm St. Cargill Meat Solutions and Foster Farms both have large processing facilities in the neighborhood, and the stench from these (and other small industrial facilities) has long plagued area residents. The Fresno Chandler Executive Airport is also on the West Side. Due to its position on the edge of the city and years of neglect by developers, is not a true "inner-city" neighborhood, and there are many vacant lots, strawberry fields and vineyards throughout the neighborhood. The neighborhood has very little retail activity, aside from the area near Fresno Street and State Route 99 Freeway (Kearney Palm Shopping Center, built in the late 1990s) and small corner markets scattered throughout. In the north eastern part of Fresno, Woodward Park was founded by the late Ralph Woodward, a long-time Fresno resident. He bequeathed a major portion of his estate in 1968 to provide a regional park and bird sanctuary in Northeast Fresno. The park lies on the South bank of the San Joaquin River between Highway 41 and Friant Road. The initial 235 acres (0.95 km2), combined with additional acres acquired later by the city, brings the park to a sizable 300 acres (1.2 km2). Now packed with amenities, Woodward Park is the only Regional Park of its size in the Central Valley. The Southeast corner of the park harbors numerous bird species offering bird enthusiasts an excellent opportunity for viewing. The park has a multi-use amphitheatre that seats up to 2,500 people, authentic Japanese Garden, fenced dog park, two-mile (3 km) equestrian trail, exercise par course, three children's playgrounds, a lake, 3 small ponds, 7 picnic areas and five miles (8 km) of multipurpose trails that are part of the San Joaquin River Parkway's Lewis S. Eaton Trail. When complete, the Lewis S. Eaton trail system will cover 22 miles (35 km) between Highway 99 and Friant Dam. The park's numerous picnic tables make for a great picnic destination and a convenient escape from city life. The park's amphetheatre was renovated in 2010, and has hosted performances by acts such as Deftones, Tech N9ne, and Sevendust as well as numerous others. The park is open April through October, 6am to 10pm and November through March, 6am to 7pm. Woodward Park is home to the annual CIF(California Interscholastic Federation) State Championship cross country meet, which takes place in late November. It is also the home of the Woodward Shakespeare Festival which began performances in the park in 2005. Formed in 1946, Sierra Sky Park Airport is a residential airport community born of a unique agreement in transportation law to allow personal aircraft and automobiles to share certain roads. Sierra Sky Park was the first aviation community to be built and there are now numerous such communities across the United States and around the world. Developer William Smilie created the nation's first planned aviation community. Still in operation today, the public use airport provides a unique neighborhood that spawned interest and similar communities nationwide. Fresno is marked by a semi-arid climate (Köppen BSh), with mild, moist winters and very hot and dry summers, thus displaying Mediterranean characteristics. December and January are the coldest months, and average around 46.5 °F (8.1 °C), and there are 14 nights with freezing lows annually, with the coldest night of the year typically bottoming out below 25 °F (−3.9 °C). July is the warmest month, averaging 83.0 °F (28.3 °C); normally, there are 32 days of 100 °F (37.8 °C)+ highs and 106 days of 90 °F (32.2 °C)+ highs, and in July and August, there are only three or four days where the high does not reach 90 °F (32.2 °C). Summers provide considerable sunshine, with July peaking at 97 percent of the total possible sunlight hours; conversely, January is the lowest with only 46 percent of the daylight time in sunlight because of thick tule fog. However, the year averages 81% of possible sunshine, for a total of 3550 hours. Average annual precipitation is around 11.5 inches (292.1 mm), which, by definition, would classify the area as a semidesert. Most of the wind rose direction occurrences derive from the northwest, as winds are driven downward along the axis of the California Central Valley; in December, January and February there is an increased presence of southeastern wind directions in the wind rose statistics. Fresno meteorology was selected in a national U.S. Environmental Protection Agency study for analysis of equilibrium temperature for use of ten-year meteorological data to represent a warm, dry western United States locale. The official record high temperature for Fresno is 115 °F (46.1 °C), set on July 8, 1905, while the official record low is 17 °F (−8 °C), set on January 6, 1913. The average windows for 100 °F (37.8 °C)+, 90 °F (32.2 °C)+, and freezing temperatures are June 1 thru September 13, April 26 thru October 9, and December 10 thru January 28, respectively, and no freeze occurred during the 1983/1984 winter season. Annual rainfall has ranged from 23.57 inches (598.7 mm) in the "rain year" from July 1982 to June 1983 down to 4.43 inches (112.5 mm) from July 1933 to June 1934. The most rainfall in one month was 9.54 inches (242.3 mm) in November 1885 and the most rainfall in 24 hours 3.55 inches (90.2 mm) on November 18, 1885. Measurable precipitation falls on an average of 48 days annually. Snow is a rarity; the heaviest snowfall at the airport was 2.2 inches (0.06 m) on January 21, 1962. Fresno is the larger principal city of the Fresno-Madera CSA, a Combined Statistical Area that includes the Fresno (Fresno County) and Madera (Madera County) metropolitan areas, which had a combined population of 922,516 at the 2000 census. The 2010 United States Census reported that Fresno had a population of 494,665. The population density was 4,404.5 people per square mile (1,700.6/km²). The racial makeup of Fresno was 245,306 (49.6%) White, 40,960 (8.3%) African American, 8,525 (1.7%) Native American, 62,528 (12.6%) Asian (3.6% Hmong, 1.7% Indian, 1.2% Filipino, 1.2% Laotian, 1.0% Thai, 0.8% Cambodian, 0.7% Chinese, 0.5% Japanese, 0.4% Vietnamese, 0.2% Korean), 849 (0.2%) Pacific Islander, 111,984 (22.6%) from other races, and 24,513 (5.0%) from two or more races. Hispanic or Latino of any race were 232,055 persons (46.9%). Among the Hispanic population, 42.7% of the total population are Mexican, 0.4% Salvadoran, and 0.4% Puerto Rican. Non-Hispanic Whites were 30.0% of the population in 2010, down from 72.6% in 1970. The Census reported that 485,798 people (98.2% of the population) lived in households, 4,315 (0.9%) lived in non-institutionalized group quarters, and 4,552 (0.9%) were institutionalized. The age distribution of the population shows 148,823 people (30.1%) under the age of 18, 62,601 people (12.7%) aged 18 to 24, 135,076 people (27.3%) aged 25 to 44, 102,064 people (20.6%) aged 45 to 64, and 46,101 people (9.3%) who were 65 years of age or older. The median age was 29.3 years. For every 100 females there were 96.7 males. For every 100 females age 18 and over, there were 93.5 males. There were 171,288 housing units at an average density of 1,525.2 per square mile (588.9/km²), of which 77,757 (49.1%) were owner-occupied, and 80,592 (50.9%) were occupied by renters. The homeowner vacancy rate was 2.6%; the rental vacancy rate was 7.6%. 235,430 people (47.6% of the population) lived in owner-occupied housing units and 250,368 people (50.6%) lived in rental housing units. As of the census of 2000, there were 427,652 people, 140,079 households, and 97,915 families residing in the city. The population density was 4,097.9 people per square mile (1,582.2/km²). There were 149,025 housing units at an average density of 1,427.9 square miles (3,698 km2). The racial makeup of the city was 50.2% White, 8.4% Black or African American, 1.6% Native American, 11.2% Asian (about a third of which is Hmong), 0.1% Pacific Islander, 23.4% from other races, and 5.2% from two or more races. Hispanic or Latino of any race were 39.9% of the population. There were 140,079 households of which 40.4% had children under the age of 18 living with them, 46.1% were married couples living together, 17.6% had a female householder with no husband present, and 30.1% were non-families. 23.3% of all households were made up of individuals and 7.9% had someone living alone who was 65 years of age or older. The average household size was 2.99 and the average family size was 3.57. In the city, the age distribution of the population shows 32.9% under the age of 18, 11.8% from 18 to 24, 28.8% from 25 to 44, 17.2% from 45 to 64, and 9.3% who were 65 years of age or older. The median age was 28 years. For every 100 females there were 96.6 males. For every 100 females age 18 and over, there were 93.0 males. The median income for a household in the city was $32,236, and the median income for a family was $35,892. Males had a median income of $32,279 versus $26,551 for females. The per capita income for the city was $15,010. About 20.5% of families and 26.2% of the population were below the poverty line, including 36.5% of those under age 18 and 10.7% of those age 65 or over. The population as of July 1, 2007 was estimated to be 470,508 by the US Census Bureau's Population Estimates Program. The Fresno Metropolitan Statistical Area population was estimated at 899,348. The Fresno Hmong community, along with that of Minneapolis/St. Paul, is one of the largest two urban U.S. Hmong communities. Fresno has no teams in any of the four major sports leagues; (NFL) football, (MLB) baseball, (NBA) basketball, or (NHL) hockey. Below are Fresno-based sports organizations. The Save Mart Center at Fresno State is a multi-purpose arena on the campus of the California State University, Fresno. It is home to the Fresno State Bulldogs basketball team and, for the first five seasons in the ECHL (2003–08) hosted the Fresno Falcons ice hockey team. It also hosts a wide range of musical acts and other events. Also on the campus of Fresno State is Bulldog Stadium, a 41,031 seat football stadium. It is home to the Fresno State Bulldogs football program. Next to Bulldog Stadium is Pete Beiden Field. It is home to the Fresno State Bulldogs baseball program and was home to the Fresno Grizzlies before their moved to Chukchansi Park in Downtown Fresno. Fresno's Woodward Park is the location of the CIF Cross Country State Championships, where high schoolers from around the state compete. Additionally the BMX course in the park plays host to the National Bicycle League State Championships. Ratcliffe Stadium, on the campus of Fresno City College, is a 13,000 seat track and field stadium. The stadium played host to the West Coast Relays. It is home to the college's football program and is also host to high school football games and track and field events. Fresno is served by State Route 99, the main north/south freeway that connects the major population centers of the California Central Valley. State Route 168, the Sierra Freeway, heads east to the city of Clovis and Huntington Lake. State Route 41 (Yosemite Freeway/Eisenhower Freeway) comes into Fresno from Atascadero in the south, and then heads north to Yosemite. 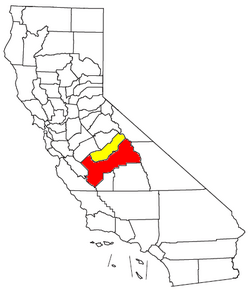 State Route 180 (Kings Canyon Freeway) comes from the west via Mendota, and from the east in Kings Canyon National Park going towards the city of Reedley. Fresno is the largest U.S. city not directly linked to an Interstate highway. When the Interstate Highway System was created in the 1950s, the decision was made to build what is now Interstate 5 on the west side of the Central Valley, and thus bypass many of the population centers in the region, instead of upgrading what is now State Route 99. Due to rapidly rising population and traffic in cities along SR 99, as well as the desirability of Federal funding, much discussion has been made to upgrade it to interstate standards and eventually incorporate it into the interstate system, most likely as Interstate 9. Major improvements to signage, lane width, median separation, vertical clearance, and other concerns are currently underway. Fresno Yosemite International Airport (FAT), formerly known as Fresno Air Terminal, provides regularly scheduled commercial airline service. The airport serves an estimated 1.3 million passengers annually. Fresno Chandler Executive Airport (FCH) is 2 mi (3.2 km) southwest of Downtown Fresno. Built in the 1920s by the Works Projects Administration, it is one of the oldest operational airports in California. The airport currently serves as a general aviation airport. Sierra Sky Park Airport in Northwest Fresno is a privately owned airport, but is open to the public. The airport was America's first aviation community. Extra-wide streets surrounding the airport allow for residents of the community to land, taxi down extra-wide avenues, and park in the driveway at home. Passenger rail service is provided by Amtrak San Joaquins. The main passenger rail station is the recently renovated historic Santa Fe Railroad Depot in Downtown Fresno. The Bakersfield-Stockton mainlines of the Burlington Northern Santa Fe Railway and Union Pacific Railroad railroads cross in Fresno, and both railroads maintain railyards within the city; the San Joaquin Valley Railroad also operates former Southern Pacific branchlines heading west and south out of the city. The city of Fresno is planned to serve the future California High Speed Rail. Public transit is provided by the Fresno Area Express (FAX) (formerly Fresno Area Rapid Transit). It consists entirely of buses serving the greater Fresno metropolitan area. Intercity and long-distance bus service is provided by Greyhound and Orange Belt Stages. The city once provided trolley service during the late 19th and early 20th century. Known as the Fresno City Railway Company and later the Fresno Traction Company, the service operated horse-drawn streetcars from 1887 to 1901. Electric streetcars were introduced in 1903. The electric streetcars were used until 1939. Army Maintenance Support Activity 14, 63rd Regional Support Command. 729 Transportation Company, 63rd Regional Support Command. 924 Training Camp Detachment, 63rd Regional Support Command. All at the US Army Reserve Center at the Fresno Yosemite International Airport. Formerly at The Fresno Yosemite International Airport. The unit is now based out of Lemoore Naval Air Station in Lemoore, California, about 30 miles outside Fresno. Naval Air Station Lemoore, the Navy's west coast Master Jet Base is 30 miles (48 km) south of downtown Fresno. 40th Aviation Brigade, 40th Infantry Division. Located at Hammer Army Air Field Armory. Echo Company, 79th Brigade Support Battalion, 79th Infantry Brigade Combat Team, 40th Infantry Division. 1106th Aviation Classification Repair Depot, 1106th Theater Aviation Maintenance Sustainment Group. Located at the Aviation Classification Repair Depot on the Fresno Yosemite International Airport. Detachment 1, 649th MP Company, 185th Military Police Battalion, 49th Military Police Brigade. Located at the Army National Guard Armory on the Fresno Fairgrounds. 144th Fighter Wing. Located at the Fresno Air National Guard Base at Fresno Yosemite International Airport. 40th Combat Aviation Brigade (CAB). 100th Troop Command Support Brigade. 1st Task Force Civil Support, Regional Support Command – North. At The Fresno Armed Forces Reserve Center adjacent to Hammer Army Air Field Armory. The Robert E. Coyle United States Courthouse houses the Eastern District of California, Fresno Division, Federal Courts. The Old Administration Building, the first permanent structure on California State University, Fresno's original campus, is now part of Fresno City College and listed on the National Register of Historic Places. Fresno, California Facts for Kids. Kiddle Encyclopedia.